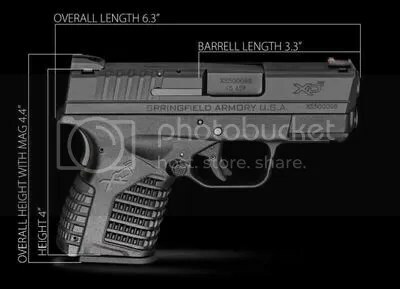 Springfield Armory announced a new pistol in the XD lineup.This small pistol is a very compact XD in .45 acp. 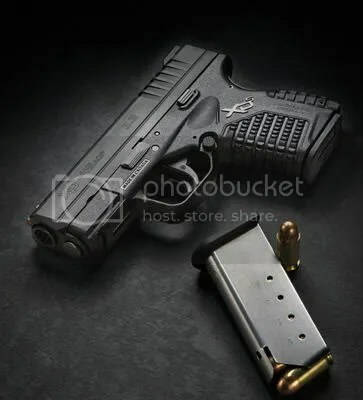 It holds 5+1 rounds in it’s single column magazine.The pistol is also thin with the width right at one inch.Right now it’s only available in .45 acp with other calibers coming down the road.The empty weight is only 29 ounces. More updates to come from SHOT! I was in my new favorite gun shop the other day and ran across a Springfield 1911that caught my eye. What I noticed was it had some features that were not stock for the period this 1911 comes from. As it turns out the person who traded this one in sent it off to Novaks for some custom work then pretty much stuck it in a gun safe and left it there. 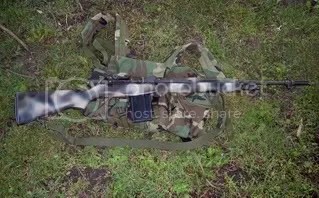 It’s had about 100 rounds fired through it since it was purchased in April of 2000. The information came from the previous owner who lives close by. 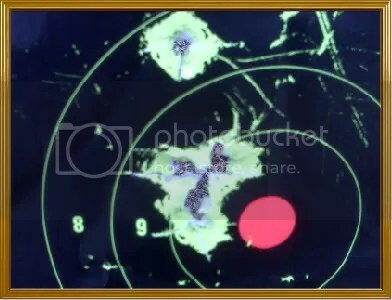 He had Novak put some of the standard Novak sights which are the best sights you can have on about any pistol. 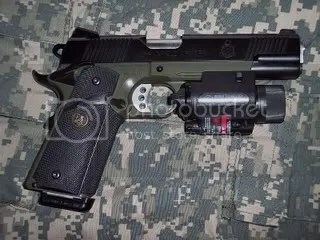 They also did a complete reliability package and trigger job which measures 3 1/2 pounds. I bit light for carry for some folks but it’s just about right for my preference. It sure is smooth and crisp and just feels great! The trigger as well as most of the internals were changed and fitted with precision from they way they look. 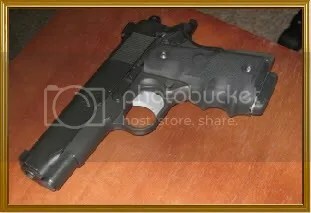 Novak also added a beavertail grip safety and a match trigger as well as an extended thumb safety. A full length two piece guide rod was also installed. Basically they did the works on this pistol to make it an ideal carry piece. The trigger feels as good as some $2000 full custom 1911’s i’ve shot. 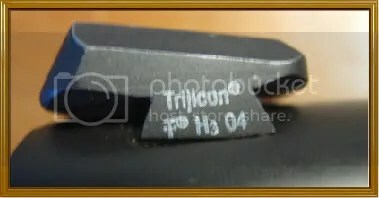 The markings on this one have 1911-A1 on the left side with Springfield Armory on the other with the company logo in the opposite location from where they place them now. 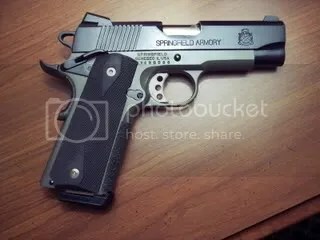 I contacted Springfield who as always was very helpful and by the serial number dated it’s manufactor date to January of 2000. 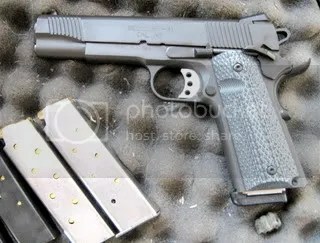 The way it came from the factory it had GI sights and hammer and just pretty much a plain jane 1911. This early model also is pure series 70 without the series 80 safety system which is another reason the trigger job turned out so well. 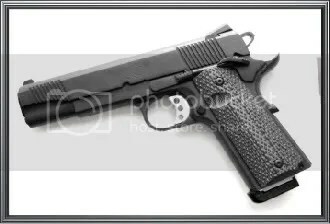 This is one premium 1911 and yes it came home with me:-) These days if you wanted to have this much work done on a 1911 it would cost you darn near $1000 just for the custom work so for $600 it’s really a bargain especially since it’s almost new from a use standpoint. As many of you know I used to buy all my guns from Cott firearms and had a link up for them. Well as things often happen the owner decided it was time for a change and moved very far away closing the shop. The new shop is in Cairo,Missouri and is owned by a very nice couple named Ron and his wife Konda. Their shop is called K&R firearms and I couldn’t recomend them more. They also order guns for customers and will do transfers to you FFL. I’ll create a page with more details later. The best part is they have very reasonable prices unlike many shops these days. They can be contacted at 660-295-4446. Besides they can’t be bad folks they both carry 1911’s at the shop when they are working! I’ll be posting some targets from the range shortly but right now a few mags is about all I can handle with 12 degree temps. 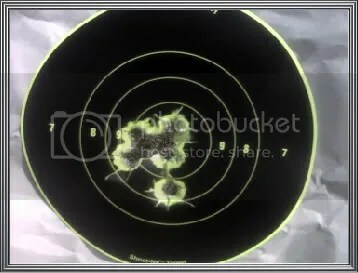 My range session started at 7 yards to establish a point of aim point of impact to ensure the sights were adjusted correctly. 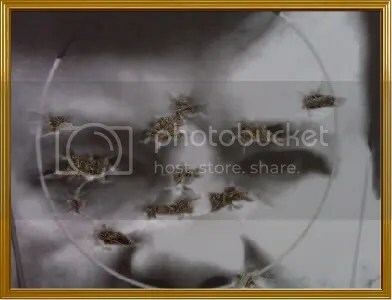 The sights were right on the money so with that done I backed up to the ten yard line well at least as close as I could since the yardage markers are under 8 inches of snow:-) My first mag resulted in a group of 2 inches with subsequent mags reducing the group size to 1 1/4 inches. Not an easy task for me when wearing gloves. I backed up to 15 yards and fired two mags which gave me groups of right at 2 inches again with the gloves on. I’m sure when it gets warmer and I can shoot without gloves I can reduce the group sizes especially the way this 1911 is tuned. 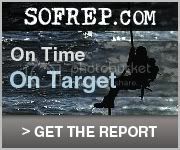 I’ll be posting additional information and range results hopefully next week. As always if you have any questions or comments feel free to comment and I’ll respond right away. As promised here is an update from my range session yesterday. It was a bit more comfortable outside and the results showed it. Novak did in fact do some accurizing on this pistol. I set the target and backed up to the 10 yard line. My very first round obliterated the red dot bullseye of this 5 inch Birchwood Casey target. It couldn’t have been more dead center if I had measured it. The second round went perfectly into the first with the third round doing the very same! I’m impressed! I backed up to the 15 yard line and you can see the results below. After these very pleasing results I moved back to the 25 yard line and fired two mags of Winchester 230 grn. flat nose target loads. Here are the results below. 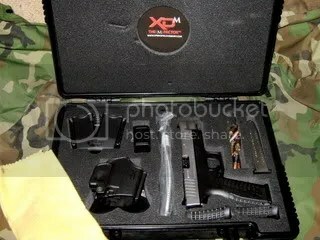 I recently traded for this Springfield XDm in 9mm. 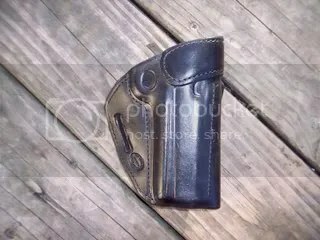 This is a real value considering the quality of the pistol as well as the nice case with the included accessories of a holster, mag pouch, loading tool, extra magazine and extra backstraps. One interesting thing about this setup is that many of the items have a Picatinny rail built in so that accessories can be attached to other accessories. For instance the loader can be attached to the mag pouch to reduce the space taken up on your belt. You just push a button and the loader releases for use. The side of the main case has a rail also so that any other accessory can be carried on the outside of the case. The pistol itself is a definate upgrade to the standard XD. It’s not only about the “M” or Match build but the change in the grip ergonomics as well as the ability to change backstraps to fit your hand. 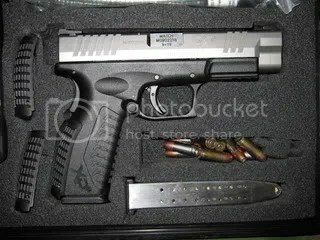 The M also has a 4.5 inch barrel which I look at as a perfect size for this pistol. The 4 inch just seemed to give the pistol a look I wasn’t that fond of. 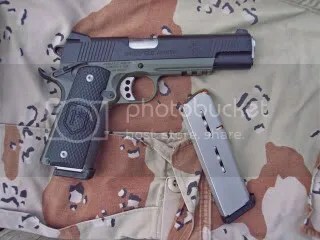 The changes made as well as the two tone finish make for a handsome pistol. The longer sight radius is also a plus. The frame cuts allow for good indexing as well for your trigger finger whether shooting left or right handed. Of course it also has what has become standard on most pistols and that’s the light/laser rail. The mag release is also ambidextrious. The one problem I saw with the magazine release is that when you have a full 19 rounds in the mag it’s almost impossible to release the mag. It’s just to tight to push the button and release the mag. You have to load 18 rounds for the mag release to work properly. I don’t really look at this as a big problem but it should be noted. I doubt this is an isolated case rather a problem with all of these. I can certainly live with 18 plus one rounds:-) The loader is also a handy item since getting to about round 15 it gets pretty hard to add rounds to the mag. 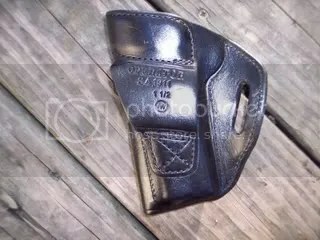 As mentioned the barrel and fitting of the barrel to the slide is match grade. 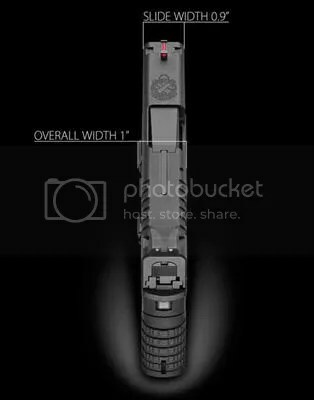 The barrel is marked match and can be seen in the photo above. Believe me it shoots match quality groups! Another issue to mention is with the grip recontoured it’s much easier to conceal even though the size accomodates the large magazine. I’ve not had a chance to measure this grip width againest a standard XD but I believe it’s a bit narrower. The slide has also been recountoured so that the base of the slide is the wider portion with the top of the slide narrower. On to shooting:-) I set a target up and shot from 10, 15 and 25 yards. I used a combination of Remington flat point as well as Winchester white box and PMC “Brass” 9mm. The grip feel is better than the older standard XD. I changed the grip backstrap and found the medium strap to be the best for me. The trigger pul is also refined from the standard XD. 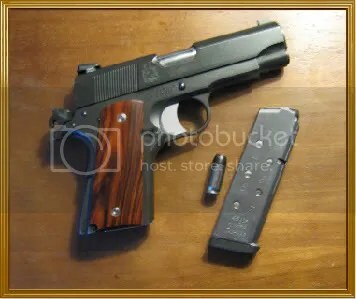 Trigger pull is 5.4 pounds with a travel length of what I would compare with a 1911 and is crisp compared to the mushy trigger of many polymer pistols. 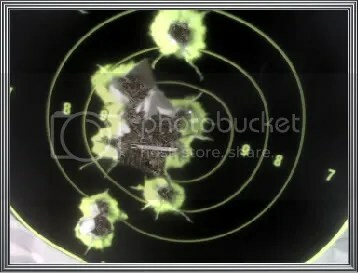 Groups at 10 yards using a 5 inch Birchwood Casey target made one hole of 1 1/4 inch with all brands of ammo firing one magazine of 18 rounds. Moving back to 15 yards the groups opened up a bit with the Remington ammo achieving the best group at 2 1/8th inches standing unsupported. At 25 yards the Remington ammo again gave the best results with groups of just a hair under 3 inches kneeling resting with my elbow on my leg and taking my time. 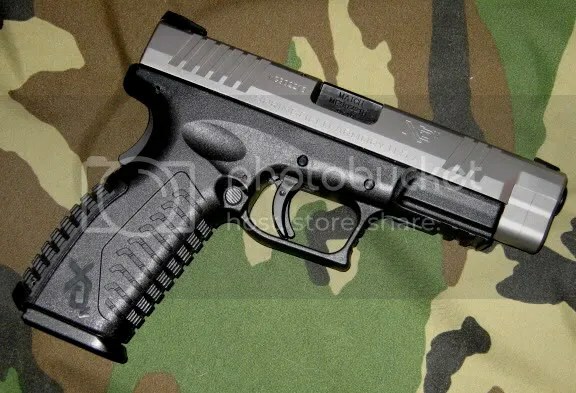 This pistol certainly shoots better than most and better than any other polymer pistol. I’m sure the match setup contributes to the level of accuracy I experienced. 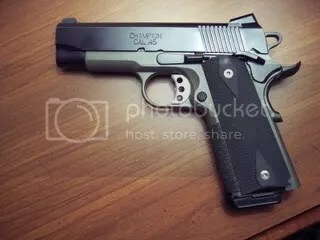 Is it a tuned match 1911 well no but this is a combat pistol not a true match pistol. In this role it excels. The pistol is a good natural pointer and comes on target fast. The sights are good with enough light on both sides of the front sight to help accuracy and speed. To be honest I’ve never been a big fan of polymer pistols especially Glocks. Ok don’t beat me up that’s just my take on them not a universal condemnation. 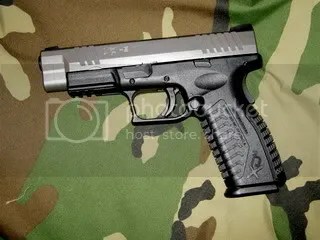 This polymer I like very much because it feels and shoots more like a standard all steel pistol. Another feature I like is the ambi mag release. I prefer to release the mag with my index finger of my shooting hand because I don’t have to adjust my grip as much or at all. When all is said and done this is a good buy and a worthy contender for a daily carry pistol as well as local competition. Any comments or questions? Feel free and I’ll get back to you pretty fast usually. Be safe and enjoy our sport! This is an update from last months post on my new M1A. I decided that as much as I love wood stocks I wanted to try a synthetic stock. I bought a USGI synthetic in OD green. For this project I wanted to see how the stock would turn out using regular automotive type paints. I checked my local hardware store that just happened to have spray cans of all the colors I needed to make a woodland camo pattern. These paints were made for painting hunting trucks, ATV’s etc. The stock itself was like new and cost $75.00. When I finished buying sandpaper,paint and a spray can of matte clear sealant I’d spent about $25.00. Now that’s an economical project! I started out by lightly sanding a few minor spots that needed smoothing. I put a base coat on in a light tan. After drying I used each individual color allowing each coat to dry before going on with the next color. I had no particular pattern in mind when I started and just kinda eyeballed the places I thought the paint pattern would look the best. After finishing with the application of the paints and allowing time for drying I sprayed two coats of the clear matte polyurethane coating to seal it and provide some protection from wear and scratches. Springfield Armory 45 in the two tone OD green with black slide. It also comes standard with Novak night sights, a match trigger with a 4 1/4 pound pull. You would think accuracy would suffer with a shorter barrel but not in this case. With the bull barrel it locks up very tight and accuracy is on a par with the full size government model. This is the lightweight frame model. You also might think that recoil would be a problem especially on fast followup shots but it’s far from it. With the dual spring recoil guide rod the recoil is reduced considerably. 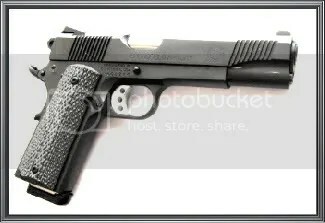 This is one 1911 you can carry all day and be comfortable. A great carry gun!